The Rookie Rockstars Primary schools Programme is an initiative that was created to give children the opportunity to work with professional musicians and singers to learn original songs, record a CD and perform in a concert. The programme is designed to embrace the 4 capacities of Curriculum for Excellence by encouraging pupils to become successful learners, confident individuals, responsible citizens and effective contributors. This is achieved through active learning and collaborative working with the whole school. Lively and original rock songs, written especially for the programme, inspire pupils to have fun while learning valuable lessons. We aim to cover key areas of Curriculum for Excellence, including Health and Wellbeing, Expressive Arts, Moral Education, literacy, and Technologies. We believe our whole school approach encourages children to take responsibility for learning as individuals and also as part of a group. Pupils participate in a unique learning experience which tackles anti-bullying, and aims to promote confidence, self-esteem, and positive friendships. Rookie Rockstars is a four-day programme. The first three days involve learning five original songs and some well known favourites. We work with the whole school together if accommodation allows this. However, larger schools may wish to split pupils into two groups. On the fourth day, the songs are recorded live and then later mixed to produce a school CD. Pupils are also given an opportunity to design the CD artwork and the winning design is printed on the final product. 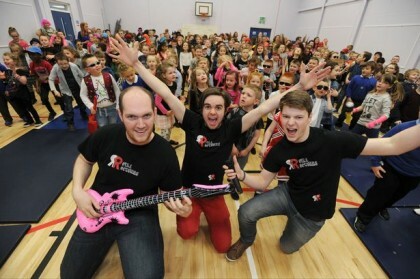 The following week, pupils perform in their own Rookie Rockstars concert. Parents, grandparents and people from the community can be invited to come and see the pupils perform. Concerts can take place in the school or at another local venue such as a community centre or church if this is more suitable.